Custom zinc backsplash sinks from Handcrafted Metal protect the wall behind your sink, and can be made at any height to accommodate your needs. Every feature can be customized, including the number, shape, and size of the bowls. Choose from additional features, such as woven aprons, drain boards, and towel bars to further personalize your sink. There's always a deck between the sink and the backsplash for faucet holes, and the height of the backsplash is normally 4" because it will stay out of the way of most kitchen electrical outlets. Our backsplashes include a cove at the bottom for easy cleaning, and a small ledge at the top for stability. 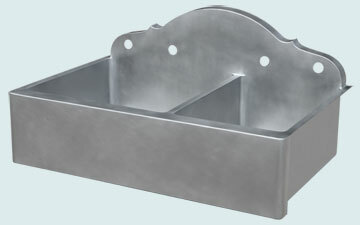 Each zinc sink is fully welded and polished, and made with the purest zinc available. Also, each sink has coved corners inside for additional easy cleaning, and can be made with drop-in mount, under mount, or flush mount rims. Also, if you need the apron front of your zinc sink to fit with existing cabinetry, we can make it match perfectly! Click on any sink below to see more pictures, and customize it according to your specifications! 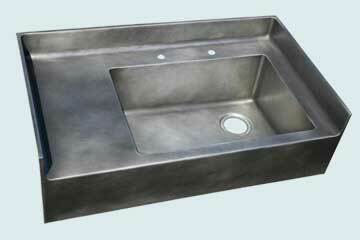 This fabulous zinc sink features short backsplashes along the back and on both sides. Our coved construction makes it easy to clean. The drain hole is in the rear-right position, and the sink is sloped to the drain. A smooth apron stretches across the front. It has a Medium patina finish with wax protection. The scroll backsplash on this 2-compartment sink features delightful curves with subtle Moroccan influences. It's completely smooth, and has a Light patina finish.